In the middle of our epic drive to Bordeaux, we decided to stretch our legs and explore the city of Nimes. People raved about the city's remarkably well-preserved Roman arena, and since I have serious 'thing' for gladiators and men in skirts, lace-up sandals and armor, we (I) just had to visit. Nimes is about 3 hours from Bormes and we pulled in just after lunch. Luckily, there were tons of signs directing traffic to the center of the city where the Arena and other ruins are located. Once parked, we wandered through the maze of buildings, apartments and sidewalk shops until we saw the exposed facade of the arena rise out of the modern, tourist-laden city center. We have both been to the Coliseum in Rome and were shocked by how much better preserved the arena in Nimes is in comparison. We read that this is mainly due to the fact that after its glory days in ancient Rome, it had been consistently used for other purposes. The arena's functionality and usefulness in society has essentially guaranteed its preservation. There's a famous sculpture directly outside the arena called Nimeno II, which depicts France's most renowned bullfighter. It's a beautiful sculpture and is great for a few fun photo-ops. To enter the arena, we paid the student price of 11 Euro which included admission and a headset. We walked around the entire stadium and learned all about the gladiators (Oh my! 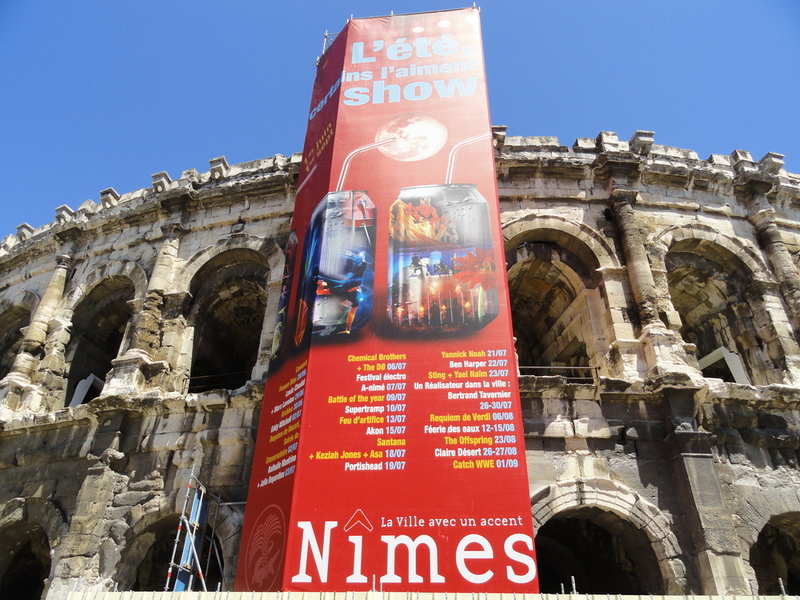 ), executions and other performances put on for the masses by the rich and powerful of Nimes. As you can see from the picture, the inside of the arena has been turned into a fully functional concert venue. We thought this took away from the history of it a bit, but with a little extra imagination, the scaffolding, stage, and lights faded away and we could envision the plebian crowds, gladiators and aristocrats cheering on their favorite fighter. One interesting addition to the arena was a room solely dedicated to gladiators which housed replicas of their armor, weapons and clothing. There were also screens showing how gladiators have been represented in films over the years. About an hour and a half, we headed out of the arena and into the city center for some food. We grabbed a delicious kebab (we've been hooked on these since arriving in France) and headed to the Maison Carrée, another Roman ruin we learned about at the arena. The Maison Carrée was pristine and beautifully preserved as well. The name literally means 'square house' and it was dedicated to the sons of Agrippa in 19 BC. We didn't go in, but we managed to catch some great pictures from the front steps. On our way back to the car, we stopped to photograph a beautiful church and happened upon a wedding receiving line. This has happened to us a lot in France...hmmm. Anyway, we paused for a few minutes to admire the occasion and thought it was the perfect note on which to end our Nimes Afternoon Adventure. After about three hours we hopped back in our trusty Fiat and resumed our drive north feeling refreshed, informed and having had my fill of Gladiator love.